It’s official, spring has sprung and the markets are exploding with asparagus right now. You can’t walk two feet without getting assaulted with these vibrant green spears. I’ve fallen in love with this cold preparation for asparagus salad. It’s perfect for a big brunch or dinner party because you can easily prep it in advance, plus the presentation of the dish with the mimosa of hard-boiled eggs is dramatic. Have you heard of eggs mimosa before? No, this is not some bizarre brunch cocktail with an egg in it. This kind of mimosa is simply finely chopped hard-boiled eggs, often used as a garnish. The preparation gets its name from the yellow blossoms of the mimosa flower. Spring blooms for a spring meal! Pro tip for prepping your asparagus this season: peel the bottom half of the stalks with a vegetable peeler to remove the tough outer skin. You will end up with a nice tender stalk that’s a gorgeous jade green color. The beauty of this dish is in its simplicity too. The asparagus gets a quick blanch before getting tossed in a bright citrus dressing, and topped with the mimosa. Scale it up or down as you need to. Easy enough for a weeknight, pretty enough company. Add a slice of EVOO-crisped bread and some creamy burrata, and that could be fully satisfying meal in itself. What I love most about this dish though is that it really lets the fresh sweetness of the asparagus shine. 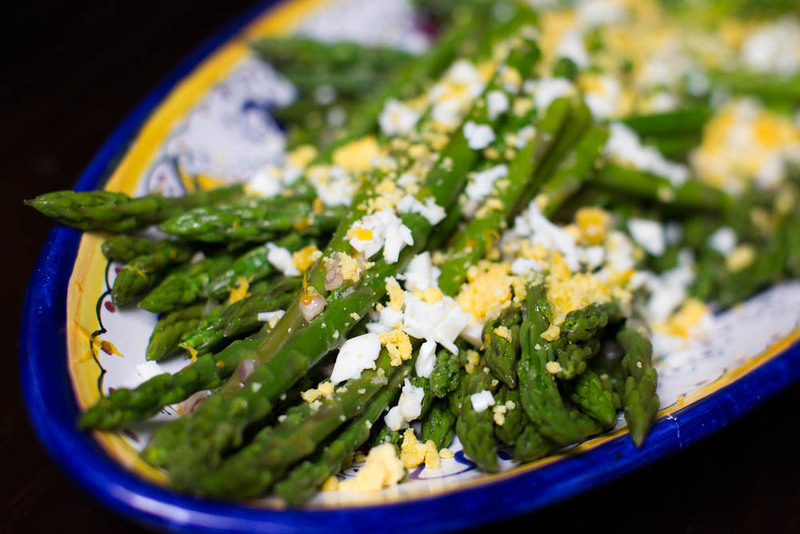 Perfect for showcasing sweet spring asparagus, this salad is topped with a beautiful garnish of eggs mimosa (fancy French for chopped up hard-boiled eggs). Bring to a boil a pot of salted water large enough to fit your asparagus. Prepare a bowl of ice water. Hard-boil your eggs -- place the eggs in a small saucepan covered with about an inch of cold water, bring to a boil, boil for a minute, turn off the heat, cover and let sit for 12 minutes. Transfer the eggs to ice water until cool enough to handle. Meanwhile, trim the tough ends off the bottom of the asparagus spears. With a vegetable peeler, peel the bottom half of the stalks to remove the tough outer skin. Blanch the asparagus in salted water just until tender (about 3-5 minutes). Drain and shock in ice water to stop the cooking. Roll the asparagus on a sheet pan lined with a towel to dry. Peel the hard-boiled eggs and separate the whites from the yolks. Mince each finely. Whisk together the lemon zest, juice, shallot, white wine vinegar, and extra virgin olive oil. Season to taste with salt and pepper. Gently toss together the asparagus and dressing until evenly coated. 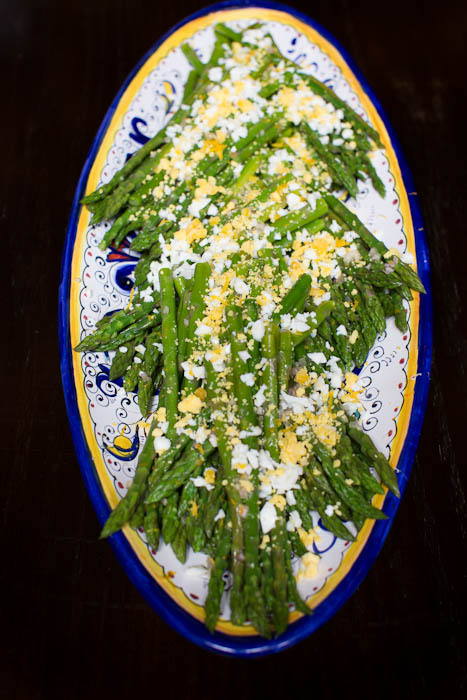 Arrange the asparagus on a platter, sprinkle eggs mimosa on top and enjoy!